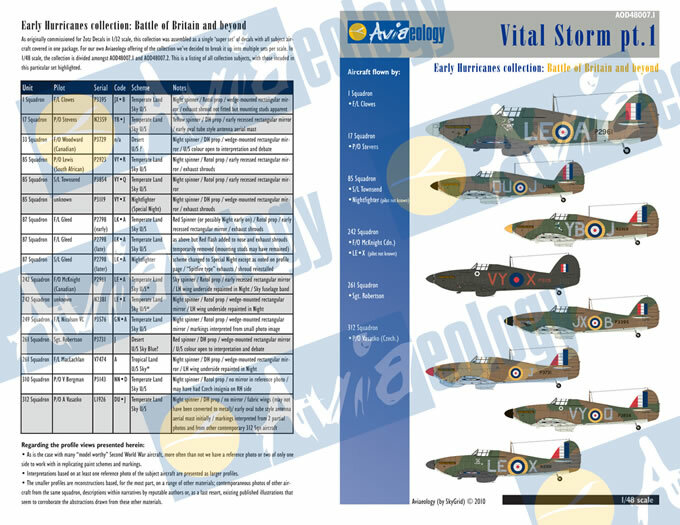 Vital Storm: Early Hurricanes, Special Addition, #AOD007. Offered in three scales; two sets per scale; each set has its own catalogue number. 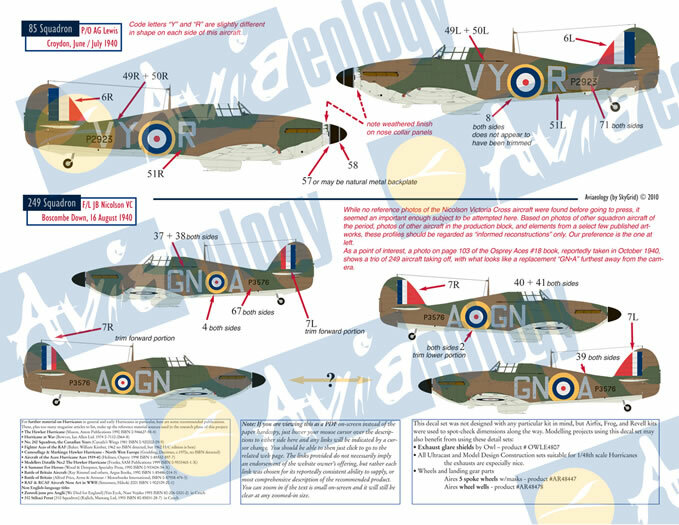 1/72, 1/48, and 1/24 scale in this release; 1/32 scale available from Zotz Decals http://www.zotzdecals.com/ as ZTZ32036. Waterslide decals, black and white laser-printed documentation by regular mail; color PDF documentation sent via email at shipment. The entire collection covers 14 early Hurricanes, primarily from the Battle of Britain period. Available online from a growing number of retailers worldwide. 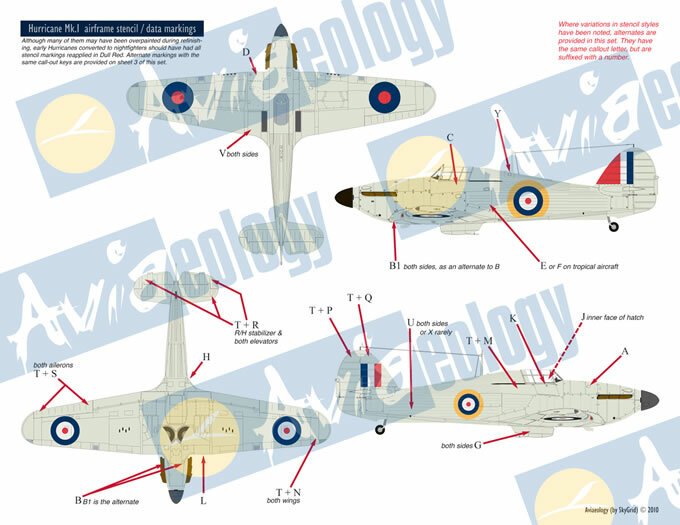 Extensively researched, thin and beautifully printed decals, excellent color PDF documentation. 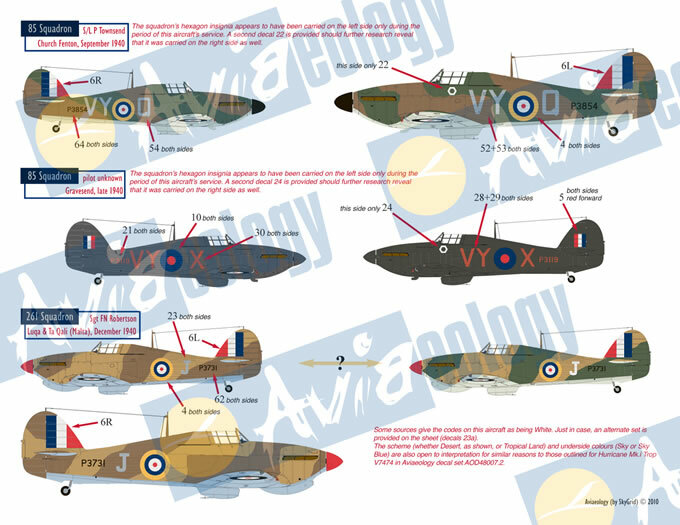 Documentation includes thoughtful discussion of historical evidence and in some cases alternative decals for the various aircraft depicted. Modelers must refer to provided electronic PDF file for color documentation (hard-copy documentation is in laser-printed black and white). 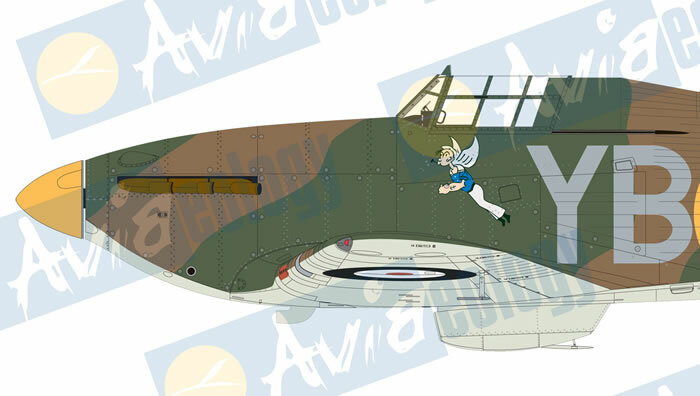 An impressive decal offering covering early Hurricanes, including striking nose art for several aircraft. Meticulously researched. 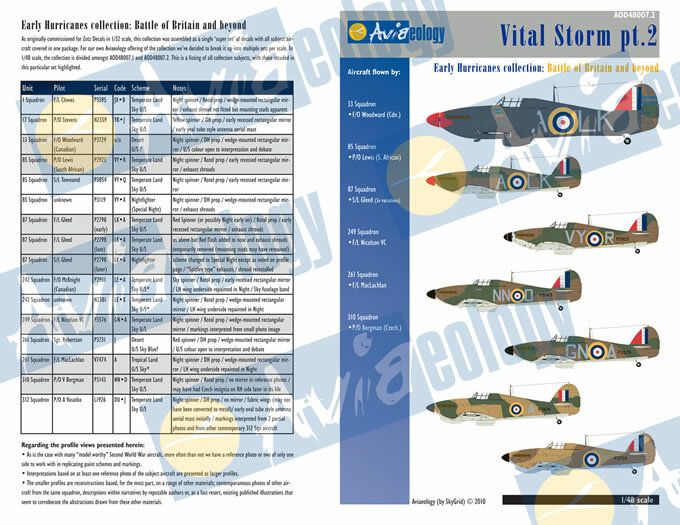 “Early Hurricanes during the Battle of Britain and beyond” is how Aviaeology describes this new release. That summary is accurate, as it’s a lovely set that lives up to its billing. But when you compare the decals to the documentation there are some surprises, all of them pleasant. If you order online from Aviaeology your first encounter with these Hurricanes begins with an emailed, full-color PDF file of the documentation, sent when your order is shipped. The aircraft images and research history provided is superb and will motivate most modelers to check their non-electronic mailbox frequently. A few days’ later three decal sheets arrive, in perfect register and thinly printed, along with a black and white laser-printed copy of the PDF documentation file. The entire collection covers 14 aircraft; in 1/72 and 1/48 scales the aircraft are divided into two sets. In 1/24 scale, a more limited selection of aircraft are covered, omitting some aircraft included in the smaller scales. 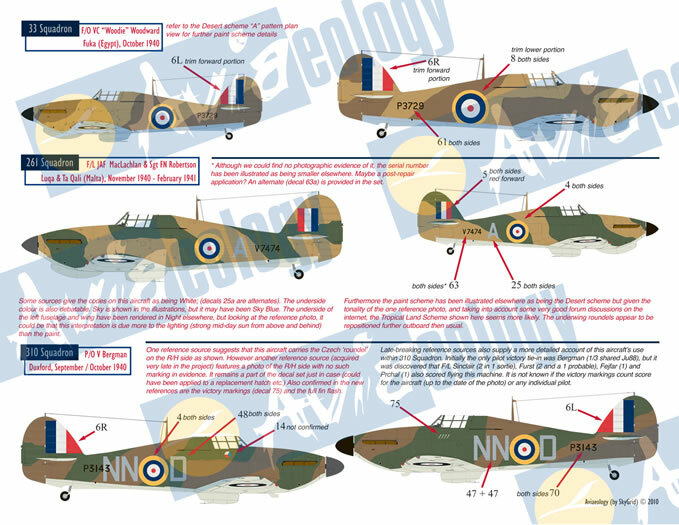 All aircraft are covered in 1/32 scale, available as a single set from Zotz Decals. 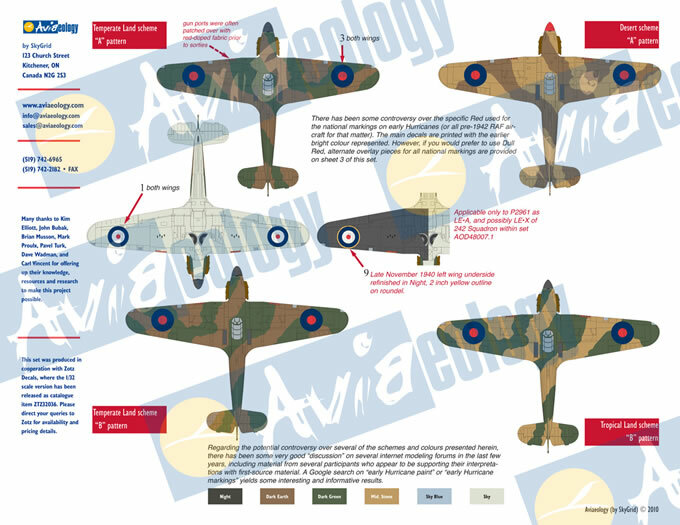 The contents of the sets are fully shown and described on Aviaeology’s website. 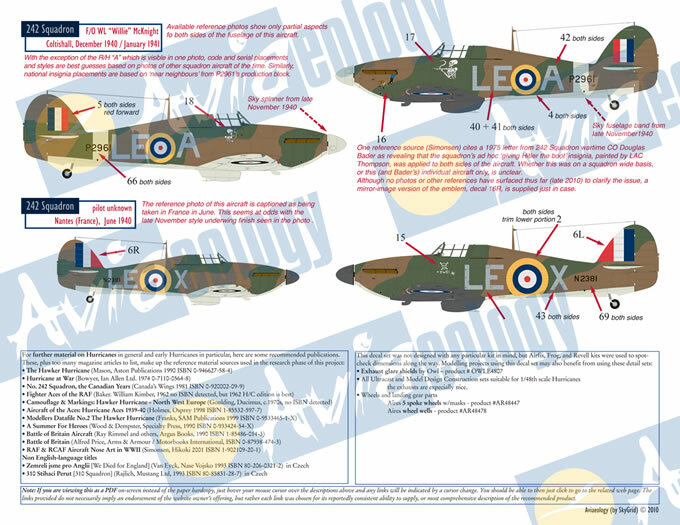 While only enough roundels are provided for one complete aircraft, a modeler may squeeze two projects out of this set if wing roundels from the kit or another source were used to complement the other markings found in the Aviaeology decal set. Interestingly, the set I purchased includes one sheet of decals all in dull red. 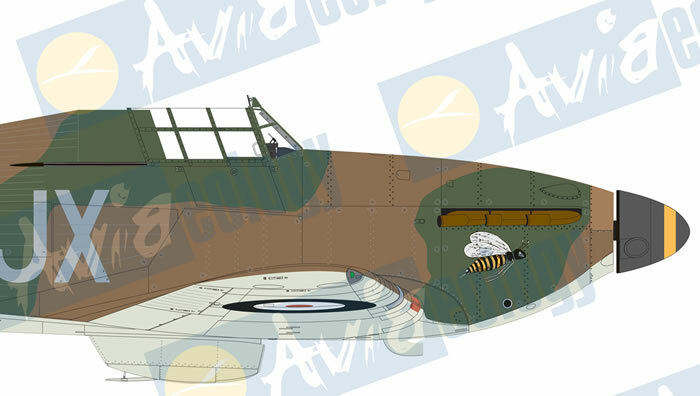 These markings are used for one night fighter scheme, and also provide alternative dull red marking for roundel center and red portions of other national markings for the other aircraft in the set. 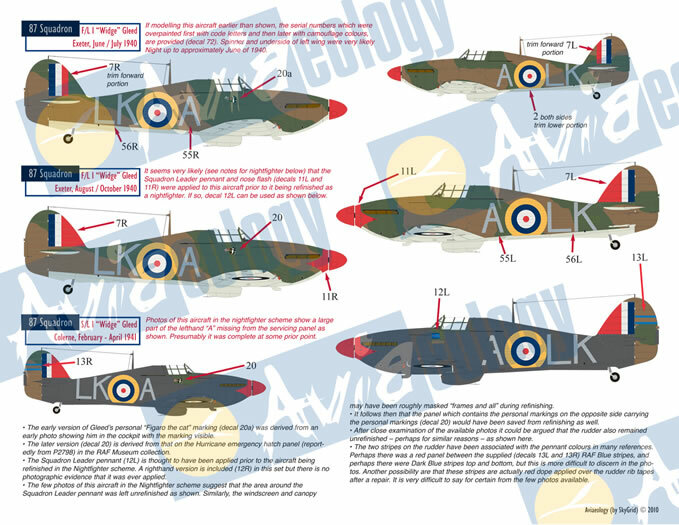 The documentation describes differences of opinion regarding the exact shade of red used on Hurricane national markings during this period of the war and gives the modeler the alternative of using bright or dull red. The documentation includes recommended aftermarket accessories, comments on paint schemes and colors, and suggestions for further reading. Incidentally, if you use the full color PDF, it features clickable links that take you to online sites where you can purchase the cited books or AM accessories. The decals are published in a limited edition. The 1/48 Part 1 set that I purchased included decals of 8 separate aircraft; one in particular stood out. 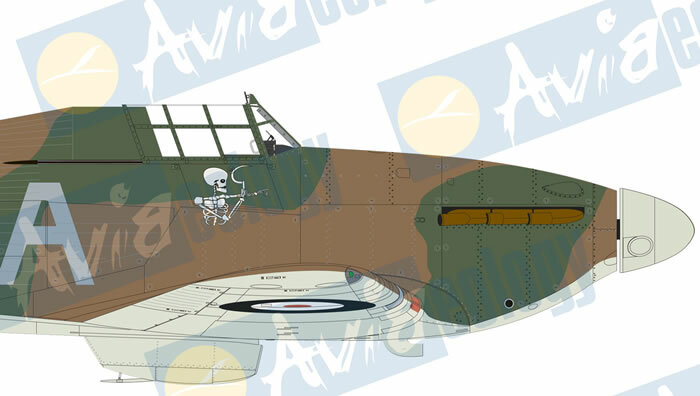 The skeletons painted on McKnight’s aircraft and the squadron’s ad hoc “give Hitler the boot” insignia are famous and a useful example of how Aviaeology approaches its subjects. I was impressed with the color documentation and the evident research, and asked the creator of the decal release to describe his approach. Terry Higgins of Aviaeology used wartime photos to form the images. “We try to ignore any existing artwork or popular interpretations of a subject, and work directly from photos or other historical evidence” he explained. 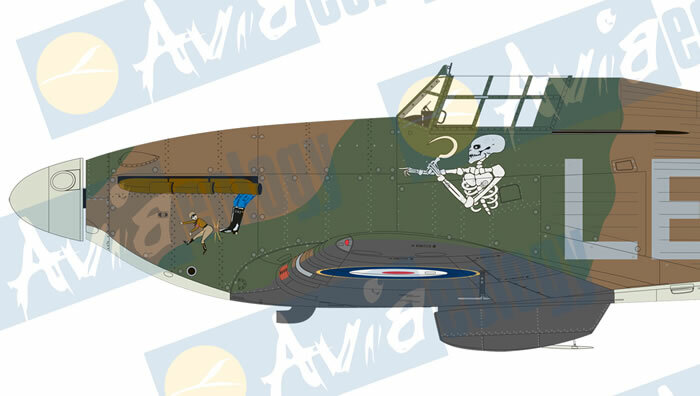 This revealed the skeleton images differed between the left and right sides of the aircraft, a point sometimes overlooked in other treatments of this aircraft. While photos of the macabre skeletons on both sides of the aircraft exist, there are no photos of McKnight’s entire aircraft, “We had to look at other evidence to develop the plane’s markings” said Terry. Photos of other aircraft in the squadron and ‘near neighbors’ from the aircraft’s production block were examined to provide clues about serial number style and other details. But even this level of research did not resolve all issues. “It’s well established that the planes in the squadron that did have the “give Hitler the boot’ insignia carried it on the port nose, but there is no photographic record that it appeared on the starboard side” explained Terry. “However, the squadron’s wartime CO Douglas Bader stated in a 1975 letter that it did appear on the starboard side. Depending on the source, and other variables like the source’s proximity to the artifact being portrayed, we regard evidence provided by recollection after the war as useful but not as reliable as a photo”. Aviaeology came up with a solution to respect both the photographic record and Bader’s recollection. They provided decals of the boot insignia for both left and right sides and explained the issue in the documentation while leaving the final decision to the modeler. It’s a thoughtful approach, revealing Aviaeology’s meticulous methodology and respect for those striving for accurate models. My next Hurricane will ‘give Hitler the boot’ twice, once per side. 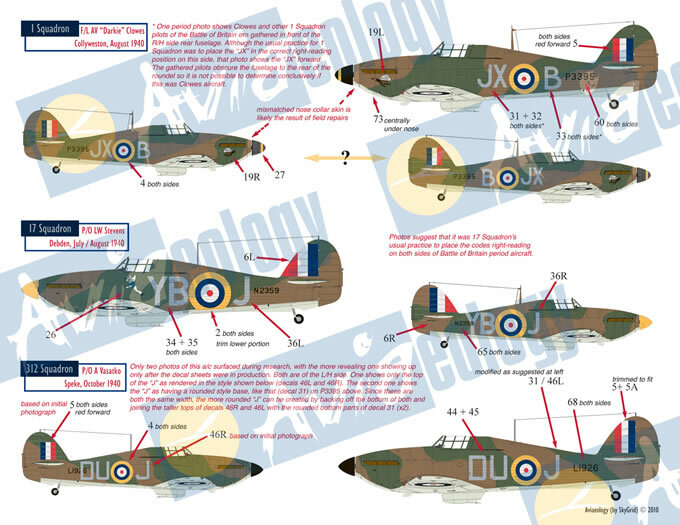 Many of the 8 aircraft in the set I purchase have a similar level of data regarding the historical references used to develop the decals. 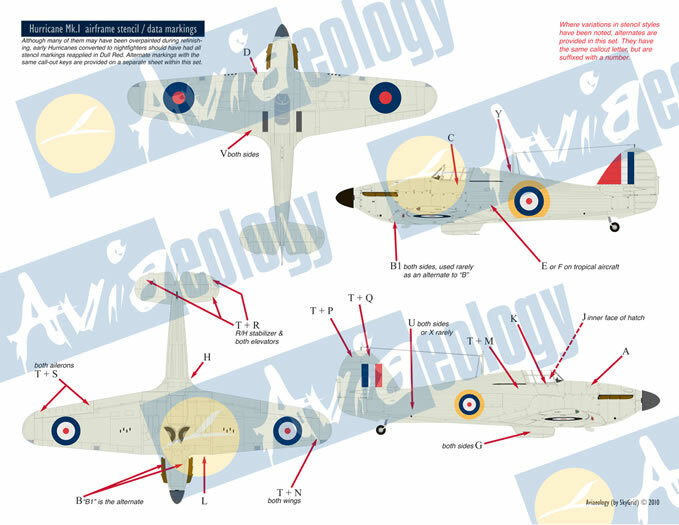 Both the decals and the supporting documentation will please and fascinate anyone interested in building an accurate early Hurricane model. Special thanks to Aviaeology and Terry Higgins for taking the time to answer my questions and for supplying the artwork used in this review.